Successfully Added Blackview Android 5.1 Smartphone - Quad Core CPU, 2GB RAM, 5.5 Inch 720 Display, 4G, Gesture Sensing, Smart Wake (Gold) to your Shopping Cart. 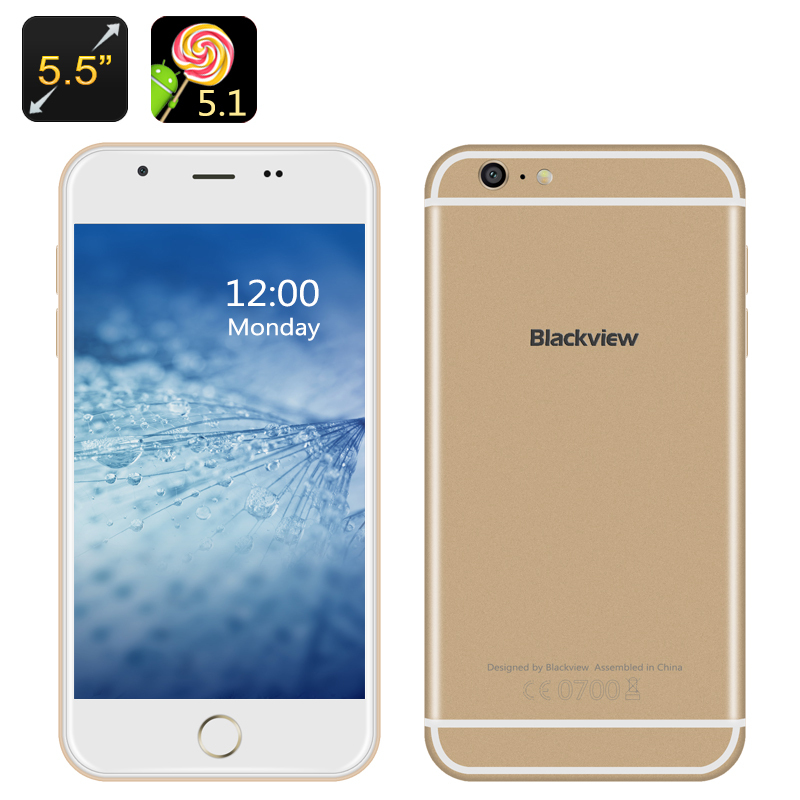 The newest phone from Blackview has premium styling, its 2.5D arc screen and rounded corners are reminiscent of big name western brands but with its flagship features and modest price it's a much more affordable option. With its 5.5 inch display and at just 7.8 mm, this slim Smartphone looks and feels great. It boats 720x1280 resolutions so you can make the most of its large screen and enjoy movies or games in fantastic detail. A Quad Core MTK SOC with Cortex A53 and 28nm technology brings fast computational prowess as it runs alongside 2GB or RAM, when partnered with the Mali GPU the Blackview is capable of running all the games and apps you could desire so you can get to grips with the latest gamming or multitask until your heart’s content. This Blackview phone comes with enhanced user interface as it has Gesture Sensing, so when you’re in the music or photo apps you can scroll through pictures and tracks by waving your hand above the display. Partnered with the efficient Android 5.1 OS you get a fantastic user experience which efficiently manages the phones resources to bring you the best performance possible. 4G connectivity is a must for any modern phone these days and the Backview has connectivity across B1/B3/B7/B8/B20 frequencies that cover many parts of Europe, Asia, Africa and many parts of the Americas. This will allow for ultra fast cellular connectivity capable of steaming HD media direct to your phone so you can make the most of that 5.5 inch screen and watch movies on the go. The 2 SIM card slots take up the same space so you can only utilize one at any time.